Mangroves full of plastic garbage in the Philippines. Ocean and earth science researcher Sarah-Jeanne Royer wasn’t expecting to publish a study on plastics. She and her team of earth science researchers with the University of Hawaii at Manoa were looking at biological sources of methane in the ocean. The source they discovered was not biological; it was synthetic. The results of this nearly year-long study were published in PLOS ONE on Wednesday. Turns out plastics aren’t just dangerous for marine life or ocean quality. They’re dangerous for the entire planet—including us—because they emit greenhouse gases like methane and other dangerous gases like ethylene when they interact with the sun. Methane is an especially nasty gas because it has 25 times the greenhouse warming potential of carbon dioxide over 100 years. As for ethylene, it’s emitted during fossil fuel production and mixes with hydroxide in the atmosphere to form carbon monoxide. The authors note that the amount of methane the plastics emit is probably a fraction of the global total, but other rare non-greenhouse gases they emit could have larger impacts. No greenhouse gas is good for the state of the planet, which is already dealing with severe warming from greenhouse gas emissions. Now, this research points to a new source of these gases that no one’s been measuring it because, well, no one even knew it was happening. The team gathered data by placing various types of plastics of different densities, sizes, and shapes into water- and air-filled containers on their research facility’s roof. Some plastics went into seawater the team collected from the Pacific; others were dunked into a form of ultrapure water. Plastics included polycarbonate, acrylic, polypropylene, polystyrene, and high-density polyethylene (among others). The plastic with the largest greenhouse gas footprint was low-density polyethylene, which is also the most commonly used. By the end of its 212 days under the sun, the plastic emitted 176 times more methane than at the beginning of the experiment in purified water. The team also moved some plastic samples into the dark after exposing them to sunlight. 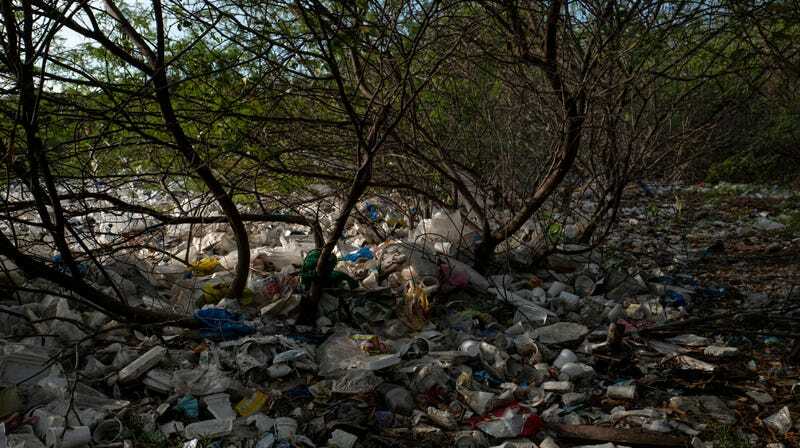 While those that never saw light emitted very little methane and ethylene, the team found that once plastic is exposed to sunlight, the process continues after the plastic’s in the dark. Those plastics that were exposed to air emitted twice as much methane and 76 times more ethylene compared to water-bound plastics. Still, this realm of work needs further research. Royer would love to quantify what the emissions from all of our plastics actually look like, but that kind of study would require a global team that could take a close look at plastic strewn in local oceans and landfills. She’s also curious of how plastics and their emissions interact with biological processes. Do the other chemicals and gases in oceans or air have any effect on this? Nevertheless, these findings are a reminder that plastic pollution and climate change—what Royer sees as the world’s two biggest issues—are tied together tighter than we thought. Ditching that plastic straw or that plastic bag may be more than a trendy way to save a sea turtle. Doing so could help address the climate, too. Correction: Thursday, August 2, 2018: This story previously said low-density polyethylene emitted large amounts of methane and ethylene in both seawater and purified water. The story has been corrected to note these numbers were only in purified water.